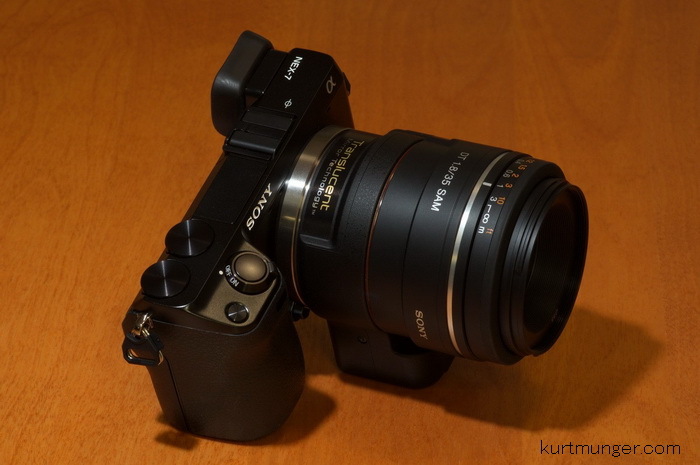 Full review of the Sony LA-EA2 NEX adapter. 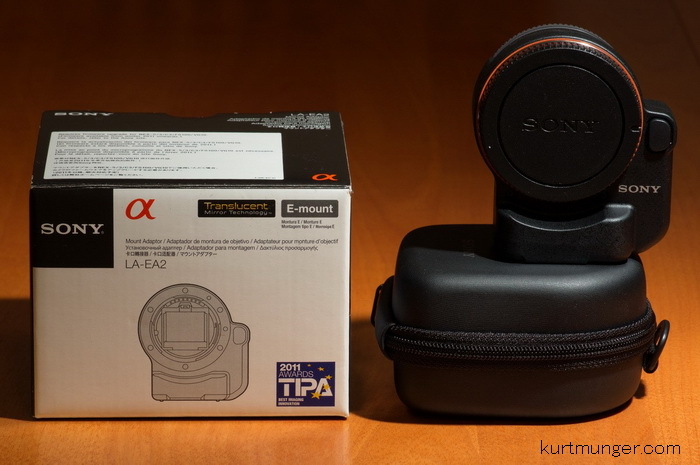 The most requested photo accessory to review in 2012 was the LA-AE2 adapter, which has become wildly popular with Sony alpha users that are on jumping on the latest NEX cameras. This adapter allows Minolta AF and Sony a-mount lenses to auto-focus when mounted on the newer NEX cameras. Currently, Sony's US website is listing this product as compatible with all NEX cameras, although you're required to update the firmware on the original NEX-3/5 cameras, and possibly the C3. I've tested this adapter on the NEX-7 and 5 different Sony lenses so far, along with using the Sony A580 as the ‘standard' for AF speed and accuracy. Right now, with my limited use, the LA-EA2 adapter really works well, in fact, I find no difference in focusing speed and accuracy between the NEX-7 with adapter and Sony A580. Mounted with Sony 70-400mm lens. In the box is a nice zippered hardcase, with caps and instruction manual in multiple languages. Here are a few specs on the little adapter. Perfectly matches the finish of Sony black speckled lenses, like the 16-50mm F/2.8. If you look closely, you'll see a very small crop to the adapter image, but this is not noticeably unless you overlay the images, it's that small. Magnified focus view doesn't work, although the ‘peaking' feature works in the normal screen view. Apparently the adapter is not set up for manual focusing. Focusing on some lenses results in subtle focusing differences from the A580 in distance, meaning the adapter is apparently reacting to a very slight increase/decrease in length from lens to sensor. This is only noticeably if you use manual focus extensively, and know where the lens usually focuses properly at when using a DSLR/SLT. Camera battery life seems about the same with, or without the adapter. Some people are reporting very low battery life using this adapter, but that's BS. Lenses tested with adapter and NEX-7. 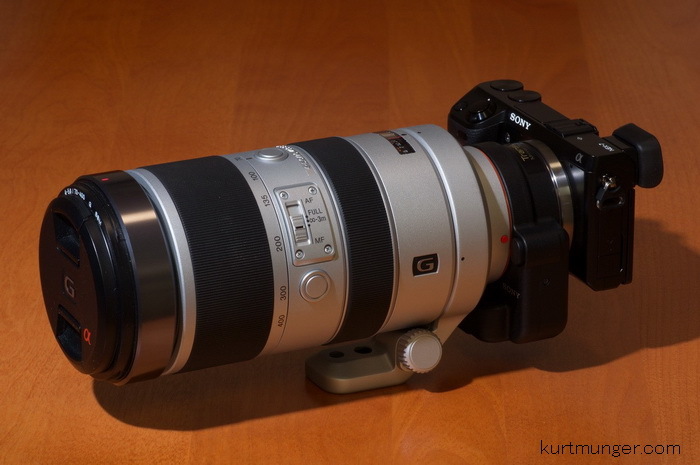 Sony 70-400mm G SSM. Perfect accuracy, even at 400mm, that's better than my A900. Sony DT 16-50mm F/2.8 SSM. The same as on the A580. Sony CZ DT 16-80mm F/3.5-4.5. The same as on the A580. Sony DT 35/1.8 SAM. The same as on the A580. Sigma 10-20mm F/4-5.6. More accurate on the NEX-7 than on the A580. Results are from my camera/adapter/lens combo, your results may vary. The Sony LA-EA2 adapter really does work as advertised, giving you full phase detection AF with your NEX camera body and ‘a' mount lenses. It's especially useful for smaller zooms, like the CZ 16-80mm, and prime lenses like the 35/1.8, or 85/2.8 which are not yet available in the NEX ‘e' mount. The Adapter does add bulk to the package, and even more so when using large lenses, so at some point you might just use a regular DSLR or SLT as the additional size and weight aren't so noticeable.